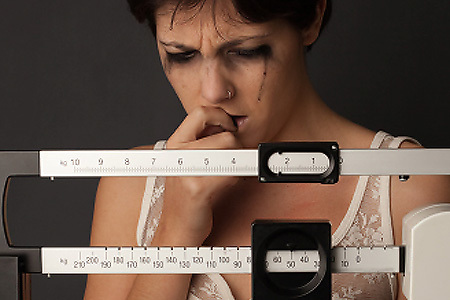 Eating disorders are rapidly becoming one of the biggest health concerns facing people today. Often, young people find that they are striving to live up to some imagined ideal set by the rest of the world, and this causes them to have a poor self-image. Many of those who feel that their appearance is not what it should be begin to take drastic measures, often resulting in eating disorders such as anorexia. Often, the person who has anorexia does not even realize that he or she has a problem. They are looking at themselves from the inside, and they cannot see or understand the real damage they are doing to their body. If you are a parent or you have a friend that you think might have anorexia, it is important that you know the symptoms and the ways that you can spot the problem. The following should help you learn more about the symptoms so you can tell the difference between healthy dieting and the eating disorder. Is it Dieting or Anorexia? Many people become anorexic after they've started what is, by all accounts, a healthy dieting process. They begin to lose weight on their diet and this triggers something in them. They want to lose more weight and no matter how much they lose, they still have an image in their mind's eye that they are overweight. Being able to recognize the differences between a regular diet and anorexia at the early stages is important, because the sooner you are able to catch the problem the easier it is going to be to control. A conversation with someone who is dieting normally and someone who is anorexic is going to be markedly different. The regular dieter has a goal of improving his or her overall health. The anorexic is invariably concerned simply with weight loss and they do not care how it happens, often taking drastic measures to ensure more weight loss. They may stop eating entirely or they may begin to purge after eating. The anorexic is going to lose weight rapidly and the weight loss is not going to stop. They will become underweight, and they will deny that they are thin. They often make statements about needing to lose more weight because they are fat. An obsession with checking their weight will often happen as well, and the slightest weight gain can cause them to plummet into a depression. This furthers the cycle. Food obsession and a compulsive checking of labels can happen as well. Weighing food, checking the mirror to see if they've gained fat weight the scale didn't detect, and a slide into depression, as well as withdrawal from friends and family can happen too. Even with all of the advice books and good intentions in the world, you are not going to be able to combat this problem on your own. You need to have the help of a professional who understands the condition and who will be able to guide you through the long, grueling and sometimes painful process of recovery.